Novetta Mission Analytics is a fully customizable web-based open source data visualization platform deployed in the Amazon cloud. 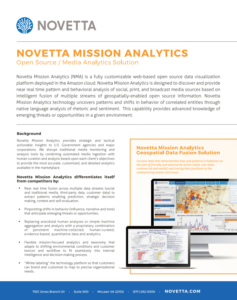 Novetta Mission Analytics is designed to discover and provide near real time pattern and behavioral analysis of social, print, and broadcast media sources based on intelligent fusion of multiple streams of geospatially-enabled open source information. Novetta Mission Analytics technology uncovers patterns and shifts in behavior of correlated entities through native language analysis of rhetoric and sentiment. This capability provides advanced knowledge of emerging threats or opportunities in a given environment. We’d be happy to prove to you just how effective our products and solutions can be.